The Celts have been here and so have the Romans, the Tatars, the Turks as well as the Austrians. So why don't you do a bit of invading yourself? The Danube River runs for 418km first along the northern border with Slovakia and then south into Serbia. Hungary is a fairly flat country with much of it less than 200 metres above sea level which makes it an ideal place to cycle. The cycle trip from Vienna to Budapest is my most popular trip in Hungary where you stay in local villages which give an insight into Hungarian life away from the tourist tracks. Travel across idyllic meadows below imposing castles and through small farming villages. 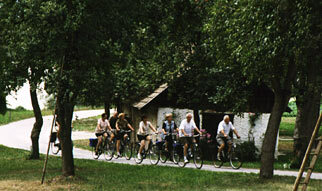 A good circular trip is the cycle from Vienna to Budapest and then take a train ride to Bratislava. From here take a bus up to Prague and then cycle or walk back down to Vienna.